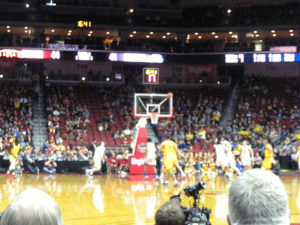 Iowa State beat Drake in the HyVee Classic. 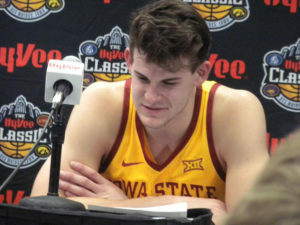 Iowa State pulled away from a 63-63 tied with 5:15 to play in the game and went on to a 77-68 win over Drake in the final HyVee Classic in Des Moines. Drake had led by five before the Cyclones came back to forge the tie. “I was proud of our guys they way they finished the game and hopefully we learned a lot from this game about being engaged on the defensive end and sharing the ball,” Cyclone coach Steve Prohm said. Prohm says it’s important for his team to stay focused as they head into the holidays. “This is the toughest time, It’s easy practicing when you get back from the holidays because you are getting ready for conference — but you can’t have one foot out the door right now. We’ve got to be dialed in in the next couple of days and get ready for Eastern Illinois,” Prohm says. Michael Jacobson led Iowa State with 22 points, hitting 3 of 4 three pointers. Marial Shayok had 18, Talen Horton-Tucker 15, and Nick Weiler-Babb 13. 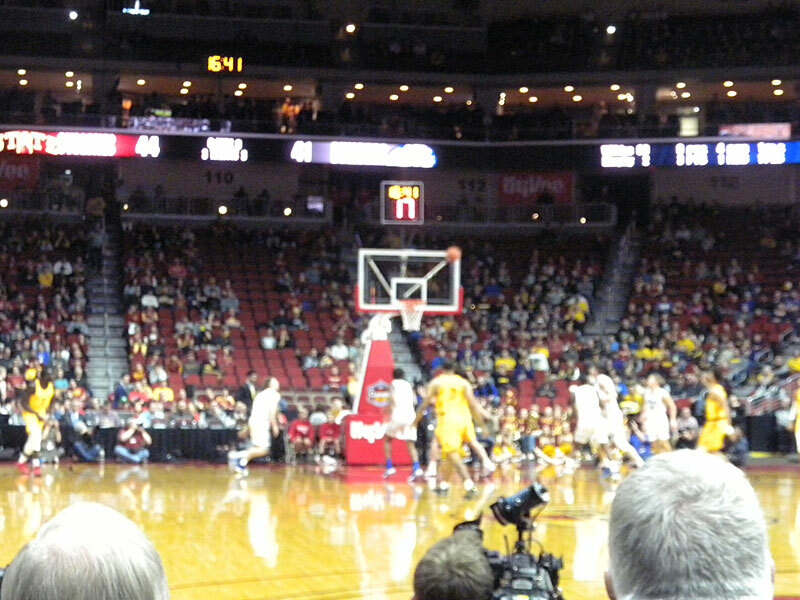 Jacobsen played high school ball in Waukee and transferred to ISU from Nebraska. He says it was good to play this game in Des Moines. He says it was special because he came to the games growing up with his family and also because he lives so close to Des Moines and the arena, Jacobsen played in Wells Fargo a few times in high school in the state tournament and says this was his best game there. 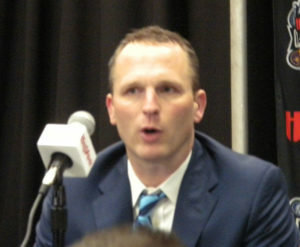 First year Drake coach Darian Devries says he was happy with the effort, but not happy with the loss. “You know we are growing and we’re getting better every day and we are not quite there yet,” DeVries says. He says while they made some mistakes, he knows they will learn from them. “What I love about this group is I know that they’ll keep working, keep continuing to get better,” DeVries says. DeVries says there’s always some extra excitement a desire to play better against an in-state team — but he says they want that to be the norm. “The thing we talk to our guys all the time …. there’s a certain level of toughness you have to come with and it shouldn’t matter what the jersey is in front of you on a given night. We want to play the same way every single night,” DeVries said. “And if we come and play with a certain level of grit and fire and toughness — you”ll take the results on most nights.” Nick McGlynn led Drake with 19 points, Anthony Murphy had 12 and Nick Norton added 11. Iowa State moves to 9-2 overall and will play Eastern Illinois on December 21st. Drake falls to 6-2 on the season and hosts SIU Edwardsville tonight (Monday). Iowa pulled away early from UNI and went on to down the Panthers 77-54 in the second game. The Hawkeyes held Iowa Northern Iowa’s A.J. Green to only two points — he came in averaging around 16. Iowa coach Fran McCaffery says they carried out the game plan very well. “You got to bother him, you’ve to be in his face. You’ve got to wear him down,” McCaffery says. Hawkeye junior Tyler Cook hit the one thousand career points mark in the second half on the way to his third double-double of the year and 12th of his career. Cook had 17 points and a game-best 13 rebounds along with five assists. McCaffery says Cook has really gotten into the flow of games. “He’s playing at a great pace. Last year he would get revved up and go too fast and he’d turn it over a few times. He’s not making those mistakes, he’s really not,” McCaffery says. He says Cook is more patient and doesn’t try to force his offense. It was the second straight victory over an in-state opponent for Iowa after they beat Iowa State. McCaffery says they will need to continue to do they things they’ve been doing when they return to conference action. Iowa finishes to 6-1 in the seven year history of The Hy-Vee Classic. They are now 8-2 overall and returns to action on Tuesday hosting Western Carolina in a nonconference contest. Wyatt Lohaus led UNI with 15 points as they fell to 4-6 with the loss.